The PDF edition of our Annual Directory makes it easy to visit our advertisers’ websites for more information on the products and services that help Oregon school food service administrators meet their meal pattern and kitchen goals. Just click on any website address or email—in ads or listings—and experience immediate connectivity with your colleagues and suppliers! In its 24th year of publication, this valuable reference is the only school food service directory that provides detailed contact information for Oregon’s school nutrition professionals working in the state’s public, private and residential child care institutions. 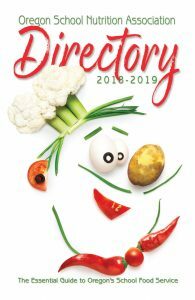 The up-to-date, fully indexed OSNA Directory provides comprehensive statewide listings of school districts and schools participating in the National School Lunch Program, and includes school nutrition director, business manager and administrator contact names, addresses, emails and phone/fax numbers, presented by county for easy reference. The targeted Suppliers Section features listings of a wide range of vendors serving the state’s school food service programs, from food brokers and food manufacturers, to equipment dealers and product distributors, to myriad service providers. Download the digital (.pdf) version of the OSNA Directory in six (6) parts below, and get instant access to interactive links to school food and equipment suppliers’ websites and Oregon’s school nutrition directors and administrators.